Aarti Mallya, founder of The Mind & Body Route LLC, earned her Ph.D. From Columbia University, has 20+ years experience in science and nutrition education, is a certified health and wellness coach, yoga instructor, and Montclair mother of twins. Mindfulness, meditation and yoga have empowered Aarti to live and parent with more confidence, energy, joy and calm and as a result, she is passionate about sharing her practice with others. Abhaijot a Humanitarian and Yogini, has always had a deep passion for yoga, she started practicing at 15 years old and never stopped. The union of the mind, body, and soul has helped her throughout her life live in a more compassionate, heart filled, abundant way. Her mentor is Gurmukh Kaur Khalsa of Golden Bridge Worldwide Teachings, where Abhaijot serves as the Lead T.A. In the Level 1 Immersions. She is a Kundalini Yoga Therapist, Khalsa Way Certified Teacher, Radiant Child Yoga Teacher, Sat Nam Raysan Level 1 Healer, Holistic Gong Certified Teacher and a Reiki Practitioner. Abhaijot serves the incarcerated Women community by teaching Kundalini at Rikers Island Correctional Facility in the Rosie Ward. She teaches in the Public Schools teaching K-3rd grade yoga and meditation weekly. Her path of service has led her around the world elevating through Kundalini Yoga and has traveled to Uganda Africa teaching to Women's Correctional Facilities, and to the youth of Uganda in schools. Abhaijot’s love affair and gratitude for Kundalini, her teachers on her path, and all of its teachings continues to embody her heart, life and classes with elevating healing love, depth, transformation, abundance, and light. Anne Sussman is the founder of Mindfulness Meeting Place. She holds certifications from the Mclean Meditation Institute as a Meditation and Mindfulness Instructor, and as a Mindfulness@Work Trainer. Looking for relief from anxiety, Anne found meditation in 2009 at a weekly class and in it, found the tools that changed her life. She holds a Bachelor’s degree in Psychology and has twenty years of experience teaching Conflict Resolution skills to teachers, parents and students, as well as parenting classes to young moms. Her goal through teaching meditation is to help others live better, both in their personal and professional lives. She has done this through her work with start-ups like Campowerment, Org Boot, and BioMatrix, where she has taught leaders in business to use meditation to improve their quality of life. She wants to bring meditation to more people and help the world be a calmer and better place, one peaceful person at a time. Anne is passionate about making the world better, not only by helping people to be more peaceful, but by helping to heal the world of food insecurity. To that end, she donates 10% of her earnings to The Interfaith Food Pantry of the Oranges. In addition, she works with the female-empowerment non-profit, Give Her Camp, and is a sustaining donor of Charity:Water. Beth has been studying and practicing mindfulness meditation for over a decade. She has trained as an MBSR (Mindfulness Based Stress Reduction) Instructor through the Center for Mindfulness at UMass Medical School and has received extensive training in other mindfulness based approaches including: Mindfulness Based Cognitive Therapy (MBCT), Mindful Schools, Somatic Experiencing and Mindful Self Compassion. She currently teaches MBSR and Mindfulness at the VA Hospital in Orange, the Krame Center at Ramapo College and at Valley Hospital where she developed the Mindfulness for Teens Program. A psychotherapist for over 20 years, Beth maintains a private practice in Montclair, NJ where she uses mindfulness based interventions and somatic experiencing in her work with families, adults and teens. Through her personal mindfulness practice and clinical work, Beth has come to value the power of mindfulness to enhance the capacity for joy and to develop greater awareness, wisdom, compassion and resilience in the face of inevitable challenges we all encounter. As a consultant, Beth trains and supervises therapists, and provides Mindfulness Workshops for educators, parents, clergy, organizations and human service practitioners throughout the tri/state area. Beth serves on the Steering Committee of the NY/NJ MBSR Collaborative. Dorothea Biba Naouai is a certified yoga and meditation teacher in practice for 30 years. She credits the practices with keeping her healthy in body, mind and spirit through the turbulent waters of professional and family life. She is an RN specializing in perinatal care for mothers and newborns. In 2016 she was certified in Craniosacral therapy and is happy to be in private practice now, where she can combine the different healing modalities she has learned to best serve her clients. Her husband and 5 grown children give her plenty to be thankful for. Namaste. Heidi Camuti completed her Hatha & Vinyasa RYT-300 and Children’s Yoga RCYT 100 training in 2010 at Lotus Yoga Montclair with Jennifer Kohl. She is also Restorative & Therapeutic Yoga Certified thru Yogaworks NYC from Master Restorative teacher Jillian Pransky and Pediatric Special Needs certified through The Yoga Way from Physical Therapist, Dr. Yana Kofman. After years of teaching to outreach populations and therapeutic clients in physical therapy for special needs, chronic pain and illness, Heidi developed an interdisciplinary approach to her teaching by integrating breath, meditation, mindful movement, beneficial restorative poses and deep relaxation into every class. Heidi has a nurturing style that guides you to opening space in mind and body, creating a sense of well-being and ease. Her classes will help you learn how to connect with intentional relaxation off the mat in real-time. Jean Vitrano has extensive experience working with the body and mind through years of training in contemporary dance, therapeutic massage, movement awareness, meditation and yoga. For the past 20 years, she has practiced mindfulness meditation and has enjoyed sharing the practice with others by leading weekly mindfulness groups and workshops. Her primary teaching influences have been Buddhist Zen Master Thich Nhat Hanh, and Insight Meditation Teachers Tara Brach and Sharon Salzberg. Jean also teaches workshops on managing stress by combining meditation and everyday mindfulness practices to manage our reactions to stress and to strengthen the pathways to happiness. She holds a BA from NYU, has been a Licensed Massage Therapist since 2002, and graduated from the Feldenkrais Method Training Program in 2011. Reiki Master Teacher, Registered Yoga Teacher, wife, and mom of two, Jennifer Hondru-Celestin has been an enthusiastic student of yoga, meditation, healing arts, nutrition and holistic health for over 20 years. Jennifer completed her intensive Reiki Master training in 2003, with the late Margaret Ann Case of ReikiArts Continuum. In 2004, she completed the 500-hour Yoga Teacher Training at Starseed Yoga in Montclair, where she had the privilege of studying with the late Jyoti Chrystal. Jennifer has spent the last decade studying therapeutic, restorative and Ayurvedic yoga with Jillian Pransky and many other specialists in healing yoga. She holds the highest level of certification (ERYT500) from the Yoga Alliance, and is also certified in Prenatal Yoga. Jennifer has a special passion for helping people find wellbeing and balance in their busy lives. She draws on her various trainings to inspire and guide her students to find balance, fulfillment, radiant health and wellness, and connection to Spirit in all aspects of their lives. Jodi Brooks R.Y.T. has been teaching yoga and meditation for the last 15 years. She has been witness to the profound and positive effects of a yoga/meditation practice. Her passion is made manifest by teaching vital stress reduction techniques through yoga, breath energy and meditation at schools and local hospice centers throughout the tri-state area. Through the study of mindfulness meditation, she has experienced transformation in all areas of life. Although she has studied with many wonderful teachers over the years. Jodi found a kindred spirit in Guru Baba Ram Dass who has helped guide her belief into daily practice. Jodi finds much joy in teaching kids, teenagers and adults to relax, find peace and acceptance in life via meditation. Her home is in Glen Ridge with her husband and two daughters. She has certification in: Relax and Renew with Judith Hanson Lasater, The Mindful Schools program, Bright Spirit Yoga, and Reiki. Joe combines the practice of yoga and meditation with the art of storytelling to illuminate the body mind, and heart. With humor and openness, and through the physical demands, language, and movement of yoga, Joe uses stories of inspiration, hope, and healing to help students access their best and most loving inner and outer selves. Joe found his calling over a decade ago when he became a certified yoga teacher after completing his first 200-hour teacher training with Vishali Varga. But Joe’s journey to the mat started much longer ago. After learning he had a form of spinal rheumatoid arthritis, a crippling, painful, and often debilitating illness, he spent years seeking relief with one doctor after another. Eventually, with the use of natural remedies, Joe was able to transform his body, mind and spirit. The experience taught him humility, patience and perseverance. Taking to heart the words of his holistic doctor that his experience could help others, Joe saw yoga and meditation as the perfect mediums. Joe believes that in order to effectively teach, one must also always be a student: He continues to study yoga, meditation and nutrition, and has amassed countless hours of training and study with many gifted teachers. Joe is also a Certified High Performance Life Coach and Chief Operating Officer of Michael Aiduss Interior Design in Montclair, NJ. He thanks all the teachers and students who have changed his life. Kati Walker was introduced to Yoga as a teenager and was immediately attracted to the physical aspects of the discipline. She then discovered the subtler qualities of her practice. Awakened to the stress management and healing benefits she gained, Kati started to study more forms of energy healing including meditation and vibrational healing. Determined to balance the demands of career, family, and study, she continued to deepen her knowledge. She appreciates that healing can happen on many levels including the physical body, the mind, and spirit or energy level. Attention to all can weave a more complete experience. Kati has studied Sound Healing with Tibetan Singing Bowls with Master Teacher Suren Shrestha, whose family lineage has supported his depth of experience. For over ten years Kati has offered individual and group sound meditation sessions around the tri-state region. Some of her clients include Atlantic Health Integrative Medicine, The Carole G. Simon Center for Cancer Care, The Cancer Support Center of Central New Jersey, and many other healing centers. Kati recently returned from Nepal where she was able to experience the culture and spiritual energies with her teacher. Kelly has been studying paths to personal growth and transformation for many years, receiving a Ph.D. in Counseling Psychology from Fordham University, a Certificate in Mindfulness-Based Contemplative Psychotherapy from the Nalanda Institute in NYC, and a yoga teacher certification from Devotion Yoga in Hoboken. Mindfulness meditation is one path that has resonated with her for its capacity to help us feel more present, centered and open-hearted in our lives. The meditation teachers who have most influenced her include Jack Kornfield, Jon Kabat-Zinn, Sharon Salzberg, and Loch Kelly. She has been practicing and teaching for several years and has had the opportunity to share mindfulness with people who have diverse life experiences from military veterans to college students. She is excited to be sharing and deepening her practice with the Qwell Meditation and Wellness community. Kelly is also a counseling psychologist with a private practice in Montclair. 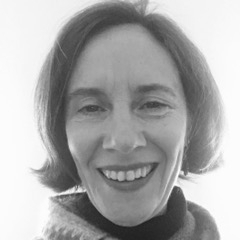 Laura is a Licensed Clinical Social Worker and Kripalu Yoga teacher with a background in massage therapy and mindfulness based stress reduction. She received her BA in philosophy from Colby College and her MSW from Fordham University’s Graduate School of Social Service. Laura brings twenty years of experience working with individuals and families. Most recently, Laura has led yoga, meditation and mindfulness based stress reduction groups for children, teens and parents to support the unique developmental needs and stressors they face. She creates classes designed to move and calm the body as well as build self-awareness through meditation and mindfulness-based activities. Laura is passionate about bringing helpful health and wellness practices to support the personal well being of people of all ages and abilities. She also loves to travel, cook, run and spend time with her family. Hooked after her first yoga class freshman year at Loyola University Chicago, Leslie Keough was later certified in Kripalu based yoga in 2003 and then taught from Ohio to Florida to California. Incorporating elements from all of the traditions she has sampled in the last decade plus, her classes are a unique blend of physical exploration and introspective surrender. In 2013 she studied with Karma Kids Yoga New York and began teaching children's yoga in the Poconos. After teaching meditation and yin classes at The Lodge at Woodloch and hatha yoga at Roots Yoga Hawley in 2014, Keough was certified as a Reiki I & II energy healer the following year before relocating to Montclair, NJ in 2015. In New Jersey, Keough has instructed children's yoga, teen yoga, hatha yoga, and yin yoga classes, as well as meditation and pranayama courses at the Jubilee Center in Hoboken, Boone Studio, YMCA of Montclair, Montclair State University, The New Jersey Center of Healthy Living, and the Adult School of Montclair respectively. She currently teaches classes at Edgemont Montessori School, Montclair State University, The Mind Body Experience and Qwell. Keough is also a Young Living wellness advocate selling essential oils and other products used in her mindfulness classes. Marissa Munn began to explore meditation as an adult living in NYC as a way to reduce stress and relieve anxiety. Since then she has taken Buddhist-based meditation courses, gone on retreats, become a certified meditation teacher through the Nalanda Institute of Contemplative Science and completed a 200-hour Yoga Teacher Training with Julie Dohrman. Marissa views meditation and yoga as beautiful ways to get to know yourself better. She hopes to inspire others to explore their inner world and ultimately live with more peace, compassion and love. When she's not meditating, she spends her time working at a global-education non-profit and hanging out with her cat, Turtle. Miriam learned the art of teaching in early childhood directly from her mother. For the past three decades, Miriam has taught in the Princeton and Montclair areas, lectured at early childhood conferences at the state and national levels, and earned a reputation as one of the area’s premier early childhood movement specialists. Sixteen years ago, consistent with her appreciation for the value of movement, Miriam became certified as a Level III Advanced Qigong instructor. In the years since, she has expanded her programs to include Tai Chi and Qi Gong for adults. Currently, Miriam teaches at the Adult School of Montclair, Saint Barnabas Hospital, and the Cedar Grove and Fairfield Public Libraries, in addition to the New Tamid and Shaarey Shalom Pre-schools. Tricia Stern is a licensed psychotherapist in private practice in Montclair with years of experience working with children and parents and helping families navigate the challenges of parenting with greater awareness and ease. In addition to graduate degrees in social work and public health, Tricia has completed training in Child Psychotherapy as well as Psychotherapy with Infants and Young Children, Trauma Focused Cognitive Behavioral Therapy, Couples and Family Therapy, Compassion Focused Therapy and DIR Floortime for children with developmental challenges. Tricia leads many workshops and teaches post graduate courses on parenting, child development and attachment. She has been interested in the integration of mindfulness, compassion, attachment and psychotherapy for many years and has studied with leaders such as Dan Siegel, Kristen Neff and Chris Germer and is becoming trained in Inner Relationship Focusing which is a body based psychotherapy. Tricia’s expertise in the areas of childhood and parenting and the connection with mindfulness and compassion serve as a foundation for her teaching outside of the clinical setting at Qwell.